2002 Mr Untel produced Les remixes de Mr Untel – Jacques Tati taken from the original soundtracks of one of the biggest French ﬁlm maker icon. This album was originally released in France by Naive and gets exposure in Japan, USA, Russia, Spain, Italy. 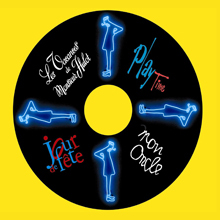 The album have been associated with the re-released of “Play Time”, the famous Jacques Tati’s movie but also feature various musical themes from a few others Jacques Tati’s movies like “mon oncle” or “les vacances de mr Hulot” and “Jour de fête” © Les films de mon oncle.